WhatsApp, The (Western) world’s biggest instant messaging app with over a billion users is in the process of creating a brand new ecosystem for its users by formalising an already popular trend on the app. Since the release of Whatsapp, its subscribers have used it to not only keep in touch but facilitate trade and commerce, be it somewhat informally. This will soon change with the introduction of WhatsApp Business which is a free-to-download app for small businesses. The app will allow companies to connect with customers and allow businesses access to some of Whatsapps 1.3 billion strong users base. What does Whatsapp business offer? The new app will allow for business profiles to be identified clearly, which will assist customers with useful information such as a business description, email or store addresses, and website. Business owners who make use of WhatsApp Business will have access to smart messaging tools to provide quick replies to frequently asked questions, greeting messages that introduce customers to businesses, and "away messages" to let customers know when the company is busy. WhatsApp Business users will also be able to review simple metrics like the number of messages read to understand which messages will resonate with their audience. The WhatsApp Business app, like the original app, will allow business owners to access the app on a desktop. WhatsApp also officially announced its closed pilot program for verifying business accounts with a green checkmark to distinguish them from personal accounts and fakes. WhatsApp began testing verified accounts for businesses a week ago. Conversations with businesses are encrypted, and they can be blocked. Interestingly, if a company isn’t already in your phone number contacts, its name will appear as whatever they register themselves as instead of their number. Why is Whatsapp launching a Business app? WhatsApp is gearing up to finally monetise its messaging app by charging large enterprises and medium-sized businesses for tools to better communicate with customers. WhatsApp business will have a freemium model which offers a free to use the app for small businesses, and as you grow, you will be encouraged to subscribe to the paid version which provides a broader range of features. The Whatsapp business app comes at the perfect time to leverage off of Facebooks latest ad tactic. Facebook has recently integrated Whatsapp messaging as the primary call to action on ad campaigns. 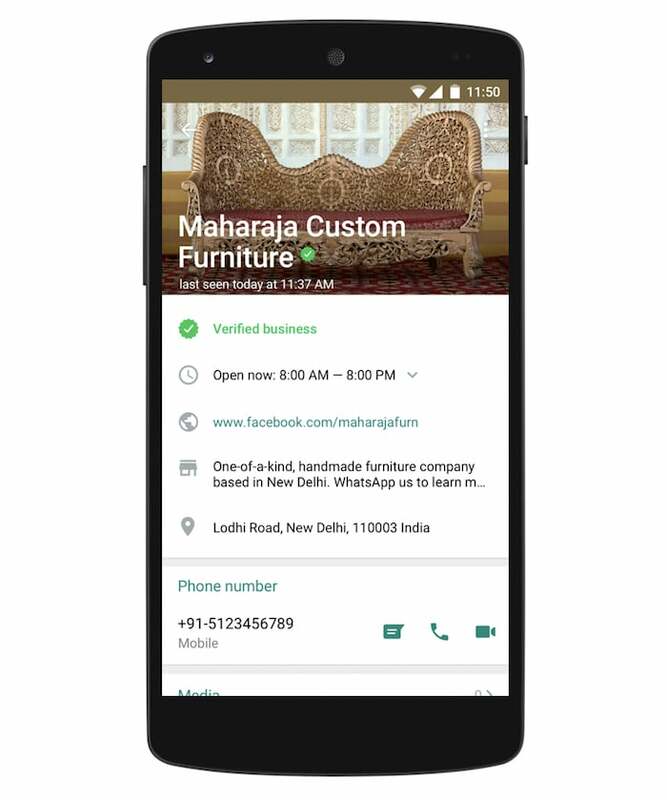 Businesses can now run targetted ad campaigns and have interested users instantly contact them via Whatsapp. Depending on how large your ad campaign is having a Whatsapp business account can definitely improve your conversion rates as you're seen as a more legitimate institution. It will also make it easier to manage the influx of messages with automated replies and other account management options. I'm pretty confident Whatsapp will add new ways to monetize its user base with light advertising options that do not feel like outright spam. Options like creating an in APP business search engine/directory with optional sponsored results, or let businesses identify prospective clients and then allow them a limited amount of cold-messaging possibly for a fee. Alternatively, businesses on WhatsApp may need to be contacted by a user first before they can respond with organic or sponsored messages similar to how Facebook messenger works. While we can only speculate, for now, one thing is for sure. This is just the beginning of Whatsapps roadmap to monetization and over time WhatsApp will have to release additional features that create revenue streams. Whatsapp will have to show shareholders it can hold its own, not only to keep the servers up and the lights on but also pay back big daddy Facebooks initial investment and patience in growing its user base.